2014 Smith-Story, Sauvignon Blanc, Sonoma County. The Smith-Story wines are all worthy of searching out and Eric and Alison Story have put together a great lineup of talent behind their wines with the likes of Ross Cobb, formerly of Hirsch and his pal Katy Wilson of La Rue, along with one of Germany’s best and most exciting producers from Ruedesheim in the Rheingau. Cobb and Wilson will really make a huge impact on the California offerings and the 2014 Anderson Valley Pinot is a good insight into how good these wines are going to be in the future. The current lineup includes a lovely pink Pinot Noir rose and dry Riesling from Germany at great prices, plus my favorite their Sonoma Mountain sourced Sonoma County Sauvignon Blanc that has the Greystack clone, non musque, which is a delightful and interesting Sauvignon Blanc. 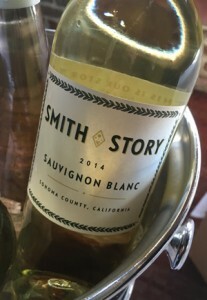 The 2014 Smith-Story Sauvignon Blanc has nice ripe citrus, peach, quince, gooseberry and white cherry layers with a core of lemon/lime and cool summer melon along with a touch of tangy herbs, wet stones and a nervy steeliness. In a world of boring $30 Sauvignon Blancs, the Smith-Story stand above and has an almost Alto-Adige kind of feel and excitement to it, like the Terlano, I was impressed, if you are looking for a good and solid value in dry Sauvignon Blanc this will please you. The 2014’s from Smith-Story are all bargains and offer lots of personality, quality and verve for the money, especially the Sauvignon Blanc. All of them are easy to love and drink now, keep an eye out for them, this is a label to watch.